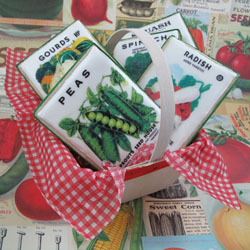 Beautiful vintage vegetable seed package images make wonderful cookies to celebrate nature's bounty. 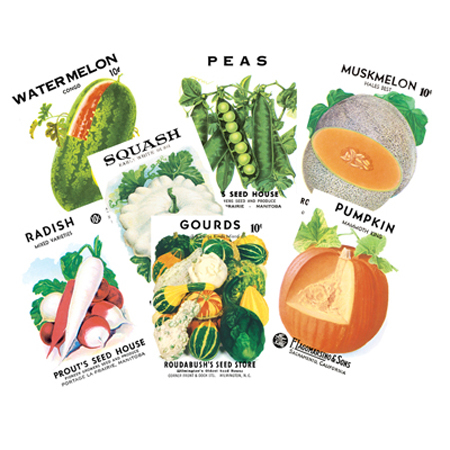 The Vintage Veggie Seed Package set includes 12 different designs (not all shown), each measuring approximately 2.75" x 4". We used a rectangle cookie cutter (SKU: 4200FDR51) to create these fetching postcard cookies. You can make quick, easy, and creative cookie and cake decorations with these edible, sugar free printed wafer paper designs. Wafer Paper is an edible starch based confection, made of potato starch, water and vegetable oil. It has been printed with food safe ink. 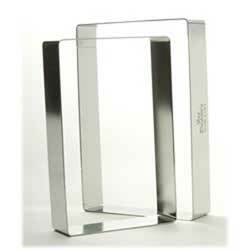 Wafer paper is fragile, so handle it carefully. It can be placed on top of any frosting: buttercream, royal icing, or fondant. Please note: Due to the nature of edible ink, minor printing imperfections may appear on some of the printed wafer paper. This is unavoidable. Directions for use: To decorate cookies, simply trace the shape of the cookie you wish to decorate with a cookie cutter. The cookie needs to be frosted with buttercream, royal icing or fondant. If applying the design to royal icing, the icing must be completely dry for best results. Simply spread a thin layer of light corn syrup to the back of your paper and then apply to the cookie. To ensure a smooth finish, turn the cookie over, wafer paper side down, on a piece of parchment paper for approximately 30 minutes. To completely dry, turn the cookie design side up for 12 hours. You can add a 3 dimensional effect by adding small sugar pearls, dragees, sugar decorations or edible glitter. To adhere, just use a small dot of clear piping gel. This was my first go round with wafer paper. The instruction sheet helped. I found getting the royal icing on the way I wanted the hardest part. Once the cookies were dry, the paper was applied, with light Karo Corn Syrup and allowed to dry. 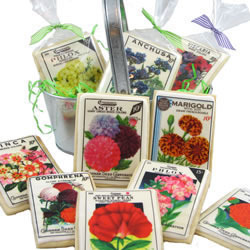 They turned out lovely and were a gift to gardening friend. perfect for the mail too! My sister sent me this set of transfers already made into sugar cookies, as per the fancyflours recipe, and i was THRILLED with my box the second i open it! I was amazed that she made them herself, they look so upscale and professional! They traveled well, not a crack in the dozen, and they tasted wonderful and fresh! ...Totally made up for not having a cake on the big day!